Dutch DJ/producer Nicky Romero has released his new single ‘Feet On The Ground’ with Anouk, his debut solo single for Casablanca Records. A remix bundle featuring new mixes from Arno Cost, GusGus, and more arrives this Monday 15 December. Fuelled by propulsive drums, artful production and a powerful refrain, the track is already proving popular, with SiriusXM's BPM giving it regular rotation. The track's also received support from Afrojack, Dimitri Vegas & Like Mike, as well as BBC Radio One’s Pete Tong and Danny Howard. The release follows up Nicky’s RIAA Gold–certified collaboration with Avicii, ‘I Could Be The One’. 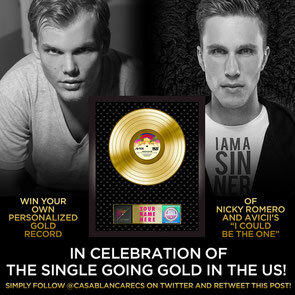 Celebrating Romero’s first stateside gold record and Casablanca Records’ fourth RIAA certification since January 2014, the label launched a special contest for the track, where the label planned to give away one customised Gold plaque to a lucky winner. Nicky Romero recently landed a #8 on DJ Magazine's Top 100, picked up a BMI (British Music Industry) award for his work on Rihanna’s ‘Right Here’, and delivered his rendition of a One Direction track live to the band on Dutch TV.